On Saturday 24 March, the Bibliotheca Alexandrina Orchestra, joined by the Bibliotheca Alexandrina Youth Orchestra and BA Choir, will perform Wolfgang Amadeus Mozart's famed Requiem. The Alexandrian musicians will be conducted by Shadi Abdelsalam, also an Alexandria-based artist, director of both orchestras and a violinist, with numerous appearances as a conductor of the Bibliotheca Alexandrina Chamber Orchestra. The choir master is Rodica Ocheseanu, who for several years has been responsible for the BA Choir. The concert features guest soloists from Cairo, soprano Ohoude Khadr, alto Rodica Ocheseanu, tenor Hisham El-Guindi and bass Reda El-Wakil. The Requiem was previously performed by the same alto, tenor, bass (and soprano Dina Iskander), orchestra, and choir (joined by the Heaven Harp Choir) in April 2015. 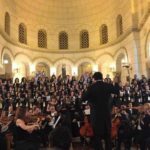 Conducted by Hisham Gabr, then director of the Biblioteca Alexandrina Arts Centre, the work was the first large-scale choral production of the revived choir and orchestra. Following its Alexandrian performance, Requiem was then performed at the All Saints' Cathedral in Cairo.